MixMeister Express Academy - Unlock the secrets MixMeister Express to create the perfect music playlist for your next Spinning / Indoor Cycling class. Unlock the secrets of MixMeister Express and create the perfect seamless playlist for your next Spinning / Indoor Cycling class! 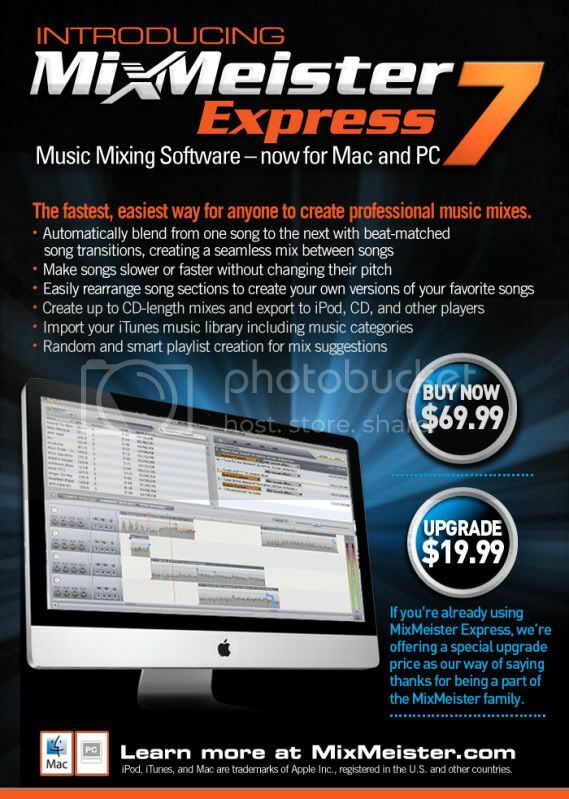 MixMeister Express 7 is now for both PC and Mac – Order your copy here. Yep, it’s $70.00 but that’s better than the $200 Mac users needed to spend for MixMeister Studio. Existing users can upgrade for $19.99. It’s a whole new install so you can keep MixMeister 6 installed and start over with version 7. I have been playing with for a few minutes and the first cool new thing is it will import a playlist from iTunes. I have always preferred to build my playlists in iTunes instead of MixMeister so I see this is a big improvement. I will have my full review soon and I will be making changes to the MixMeister Express Academy to reflect the new features. If you prefer to use an automatic BPM counter MixMeister has one you can download for free. Here is the link. In just a few hours you could be an expert at mixing music and creating your own seamless Indoor Cycling class playlists. Lesson 1 explains how to convert all your iTunes music to a format that will work with this BPM counter. This time I had a proper backup that was automatic. I didn’t need to do anything. After all the work you go through, ripping & purchasing music and creating playlists, don’t be a fool and trust your hard drive like I did. Watch this short video as I recover my music from my online backup service. You can get a free trial here. One trick I learned when I was training as a competitive cyclist was “Don’t Stop” during your training rides. No, I don’t mean blowing through stop signs. Don’t stop during your training ride, even for a short break. I found it’s all about creating and maintaning momentum that keeps you focused. And that focus helps you ignore the pain or discomfort you are feeling. Not stopping also develops muscular endurance in your legs. Think of your Indoor Cycling Class as a very compressed training ride. As the Instructor you should be doing everything you can to help your students maintain their focus and maintain a constant effort. You will be helping them develop as endurance athletes and they will thank you for it! There’s still time to change the road you’re on… Led Zeppelin, Stair Way To Heaven. Yes, when it comes to learning something new there are always two ways you can approach a task. Amy (the senior Group Fitness Instructor in our family) would tell you; there are two ways of doing most anything… there’s the guy’s way and then the right way! “Ask for directions? Are you kidding? If you have a lot of extra time and the patience to work through the normal frustrations involved with learning something new, then go for it. If you want to spend the whole weekend learning how to mix your playlists, be my guest. Here is the link to purchase MixMeister Express. But you are on your own. You would find someone who knows more than you and ask for some help, wouldn’t you? If you are lost somewhere you stop and ask a local for directions. Your Spinning / Indoor Cycling classes will never be the same again! The Academy will be open to enrollment on Wednesday Oct 14th at 6:00AM EST. I suggest downloading a free trial copy of MixMeister Express now. Then you will be ready to learn how to create seamless class playlists.